Last week William and I delivered another Talk About Local training session for the Peabody Trust at the Pembury Learning Centre in Pembury Estate, Hackney, which is already served by its own hyperlocal website pemburyliving.wordpress.com. There was a mix of staff, volunteers and residents present all looking to do different things – some already had a website they were looking to develop, some were looking to create something new entirely, whilst others were looking to contribute to an existing website like Pembury Living. This variety meant the session became one of collaborative learning rather than a traditional training scenario, with everyone sharing their knowledge and experience with others in the group. Everything and anything that’s to do with the local community. At the moment, it’s mainly centralising on the centre itself but now we are just starting to go out into including the local community in the posts. And we’ve got a ‘post our plans’ soon by foot messenger, sending leaflets around the local community. All it is, quite simply we pick people totally unexpectedly and we profile them. We do an interview with them just as you’re doing with me and we quite simply take a photo, put it online, call it Character of the Month. Each month we will do one. Usually we try to pick somebody you don’t expect to have some unusual quirks or backgrounds…The last character we had was Stephen, who’s for May…he was actually a singer and he used to do Tom Jones, Elvis and all those back in the seventies. So, there’s quite a few characters we’re meeting in the centre. It’s good fun…awkward at first, but then it’s the same as most things to do with the blog, once you get used to the terminology and the phrases they actually use, so how different they are from the normal spoken word…once you get used to the phrasing it’s fairly logical. It’s a logical process…. I’ve got a feeling we’ll be flying in a week or so. It will certainly help to widen the reach of us at the moment. The longest range that we have at the moment is we’ve got one follower in Montreal and we’ve got a few up on the borders of England and Scotland. But we’ll widen it even further, the further the better, I don’t mind! I’ll probably use Facebook as well and experiment with others, just see how they go. But I don’t want to add them too quickly because you can only learn a certain amount at a certain time and I don’t want to jump in with both feet and find that I’m drowning when I can just survive with one foot in the water! They all know me now, everyone around the centre has come to know me as I’ve always got a camera around my waist. But I’ve got a couple of spies in there now with a couple of cameras – I’ve planted spies! We’ve got an unspoken agreement really that we won’t put up anything up that anyone’s going to be embarrassed about or would cause a problem. 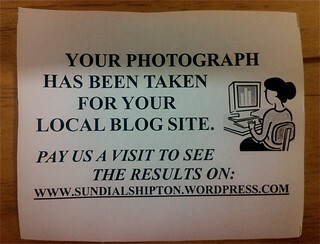 We also give out a little ticket to anyone that we take a photo of, so: ‘You’ve had your photo taken for your local blog’ and it’s also got the details of how to find the blog. Because most of our clients in the centre are elderly, so what it is they go home and: “Oh, we’ve had our photo taken for a blog – what’s a blog? !” And they give this slip to their family and the family will bring it up on their computer so that actually increases the spread.